Loaded has long been crafting longboards, and is now designing and handmaking snowboards in California. The Algernon snowboard is a work of art and a really thoughtfully designed board. Dan Coski from Wintersport describes the board in two words: "super fun." He explains, "The construction of this all-mountain freeride board is designed to get you further back on the tail of the board, with more float in powder." The board's construction is 100 percent bamboo, with cork footbeds on the top deck. This board is available in multiple sizes and features a four-year graphic. Looking for the perfect boot but hate the process of buying boots? Check out the Descendant series from Full Tilt. The Sports Creel's Micah Genteman explains what differentiates them from other boots: "In the boot business, they call it a mold breaker. They don't start from something and adjust it. They built it from the ground up." The boot is lightweight and comes in three different men's and women's models, depending on the preferred stiffness. All of the models feature Intuition liners — full wraparound for the two upper-end versions and a traditional tongue on the more intermediate pair. "These boots have a really good fit," says Genteman. "They're some of the best custom liners that we've ever worked with. 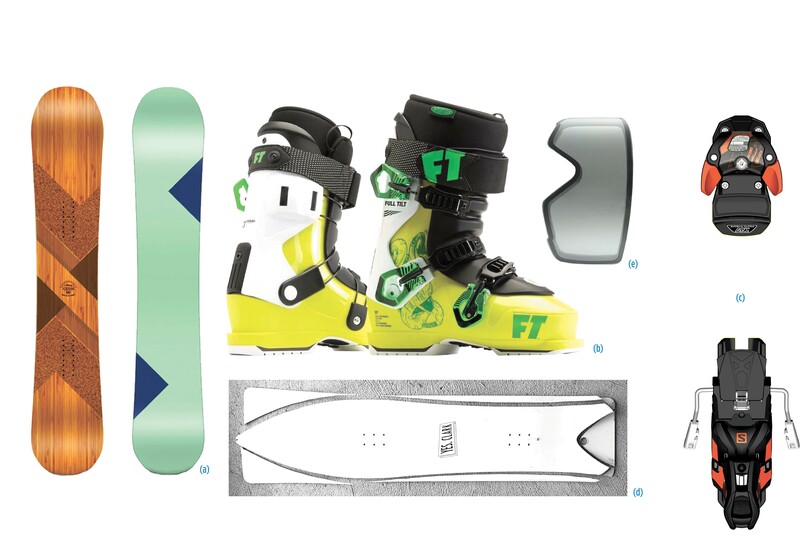 This boot dispels the myth that you need to be a freestyle park rider to have a pair of Full Tilt boots." Most skiers take a lot of time and energy getting their boots to fit perfectly. As AT/backcountry boots, such as Dynafit, are passing the test for backcountry travelers as a solid all-around boot — one that can easily be used inbounds — manufacturers are jumping at the chance to offer bindings compatible with both standard downhill and AT boots. Salomon is introducing the Warden 13 this season, which fits that niche perfectly. Rick Chatham at the Alpine Shop describes them as "an inbound, everyday, bulletproof binding. This binding is Multi Norm Certified and features an anti-friction system that slides to aid lateral release of the binding when necessary." The Warden also features a power toe piece for precise steering and automatic wing adjustments to match the width of your boots. "In years past, most skiers would need two pairs of skis and two pairs of boots for inbounds and touring," says Chatham. "Now you just need one pair of boots, but still two pairs of skis." YES. Snowboards is making waves in the snowboarding powder-lovers scene this season with the introduction of the Clark board. Basically, it's one long rectangle. The buyer gets to design the shape, trace it out on the board and carve it out themselves. This is the perfect option for a snowboarder who has some handyman skills, access to a jigsaw and wants to design their own board shape. Rhen Lyden from Hayden's Ski Shack explains: "This board is designed for deep powder snow. The construction is a poplar wood core with fiberglass and no metal edges. This is geared for that creative guy that has been thinking of a shape or an idea that he would like to ride, but no one has ever made it." Now they do. Thu., April 18, 12:30-3 p.m., Sat., May 11, 10 a.m.-12:30 p.m., Tue., May 14, 12:30-3 p.m., Thu., May 23, 12:30-3 p.m., Sat., June 8, 10 a.m.-12:30 p.m., Tue., June 11, 12:30-3 p.m. and Thu., June 20, 12:30-3 p.m.